Drivers Best Friend - Headsets Direct, Inc.
Are you constantly on the road for business or a busy “Soccer Mom”? The phone is ringing off the hook but there is just too much traffic and the kids are crying, you are too frustrated to answer? With the push of a button you can now answer that call and keep both hands on the wheel! 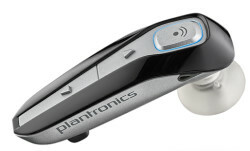 The Plantronics Discovery 665 Blue tooth Headset offers a sleek style with superior road conversation ability. With In-the-Ear wear the Discovery 665 is equipped with AudioIQ digitally enhanced sound technology offers amazing clear sound between you and your caller. Do you have those moments when you can’t even hear the phone ringing? Don’t worry, the 665 has a call indicator light to alert you when a call is incoming. The Discovery 665 has 3 sizes of soft gel ear tips and an ear stabilizer loop for comfort. With a compact vehicle power charger your headset will always be ready when you need it. The Discovery 665 is compatible with all Blue tooth Items. Get your Discovery 665 today and drive safely with both hands on the wheel!